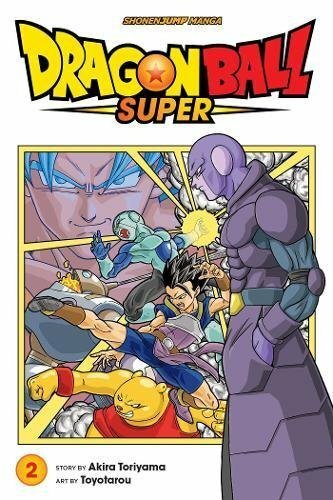 Volume 2 of the DB Super manga contains Chapters 10 – 15, and within that time covers a hell of a lot of story. In fact the Champa arc, pitting Universes 6 and 7 against each other that started in the previous volume, ends at Chapter 13, leaving the two remaining chapter to kick off what is officially known as the “Future Trunks arc”, but has more commonly been referred to as the “Goku Black arc” due to Dragon Ball’s more common trait of having arcs named after the lead villains. At the end of the tournament Goku faces off with Universe 6’s top hitman … Hit, and is beaten back for a good while before achieving near-victory, and then leaving the ring as Hit wasn’t using all his techniques due to the no kill rule (he also wanted to see his own Universe’s top fighter Monaka in action, though it turns out Monaka is a fake Beerus drafted to motivate Goku and Vegeta…). What the key difference here is Goku’s strategy against Hit. In the anime he combines the Super Saiyan Blue form with the Kaio-Ken attack (from way back!) to create enough power to push Hit to his limit, before eliminating himself. In the manga, on the other hand, he uses the red Super Saiyan God form because the Blue form uses too much energy (leading to a manga-only line towards Vegeta, claiming he could have beaten Hit had he not used Blue against his would-be Saiyan protégé Cabba in the match before), only pulling out Blue for the big attack at the very end. In other words, in the manga Blue is the all-powerful form he can only use for short bursts, where as in the anime it’s the new Super Saiyan Blue Kaio-Ken form, with Super Saiyan God not making a second appearance until the currently airing Universal Survival arc. I also have to mention that once again the non-action parts of the story are cut, the whole summoning the unfathomably large dragon and wishing with the Super Dragon Balls is literally a single panel in the middle of one page, with just another page and a half of dialogue to wrap up the arc. If the anime didn’t exist it would be a rather frustrating way of storytelling, all action and nearly-literally no pay-off. As I mentioned, the last two chapters cover the start of the Future Trunks arc, which kicks off with the titular character running from an unstoppable foe and eventually heading back to the main timeline, leaving his lover Mai behind. It is soon revealed that the enemy has Goku’s face, but not his whole no killing policy… Though there are some differences again (mostly skipping over a lot of Trunks’ new re-tragic story and instead explaining some of those events in dialogue) the only real one of note is a scene where Trunks is sparring with Goku and the latter turns Super Saiyan 3 to show Trunks, who had only obtained SS2, that there is a further form (or three…) to go. In the anime, that was that, Trunks was beaten easily and warned Goku that Goku Black was much stronger than that, but in the manga Trunks powers up even further while still Super Saiyan 2, leading to characters remarking that his power was now comparable to Goku’s Super Saiyan 3. He then goes toe-to-toe with Goku before being beaten, with Beerus remarking that Goku briefly used his Super Saiyan God form to land the winning blow, something Whis claims is “childish of him”. It’s funny that people (rightly) complained about Trunks’ mysterious power-ups in the anime version of the arc, but the Manga was apparently doing it even earlier! So Dragon Ball Super Volume 2 is at least more steadily paced than when it rocketed (and skipped) through the first two arcs of the series in Volume 1, though it still cuts out all dialogue and scenes that don’t give the chapters wall-to-wall action. Probably best viewed as a side dish to the anime’s main course, rather than the sole way to experience these new story arcs from Akira Toriyama. Either way though, the great artwork deserves praise, and it’s fun to read, so long as you don’t want much story in your fight scenes! The third volume of the Dragon Ball Super manga pushes forward with the Future Trunks arc, full of twists, turns, timelines and dystopias. Is it any good though? Viz Media has revealed a major restructure for their Shonen Jump label – including a discontinuation of the digital magazine, and the opening of a back catalogue!